Traditionally, it has mainly been in the small bus and community transport sectors that the provision of devices to help those passengers with mobility impairment to board has been focussed. To a very considerable degree that remains the case because of the more specialist needs of many of the passengers carried, particularly on specialist contracts, but the clock is ticking until the Public Service Vehicles Accessibility Regulations 2000 (PSVAR) regulations come into force. These utilise the powers in part five of the Disability Discrimination Act 1995 (DDA) and are already exercising the minds of those who have non compliant vehicles. From 1 January 2016, single deckers over 7.5tonnes on local or scheduled services must be fully accessible and all double deckers on such work must be from 1 January 2017. Buses up to 7.5tonnes must be fully accessible by 1 January 2015 and coaches used on local or scheduled services by 1 January 2020. 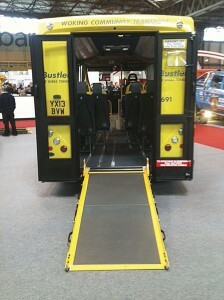 The www.gov.uk/government/publications/bus-coach-accessibility-faq link contains more information. In many cases satisfying PSVAR will not be a question of converting existing buses but buying compliant secondhand vehicles, though there will be some non DDA compliant low floor vehicles that can be converted to comply. In this feature, Chris Peat looks at some of the equipment available to fit to new vehicles of all sizes, particularly smaller ones, and to upgrade existing ones to make them accessible. One of the first and most important challenges of accessibility is how to get passengers with mobility issues on board in the first place. 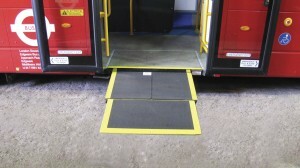 Lifts and ramps are one of the answers to this and one of the companies at the forefront of providing these for service buses is Compak Ramps. The UK manufacturer works with bus and coach builders from across the world, including Volvo, Scania, Mercedes-Benz and Van Hool amongst others. It has distribution and service agents across the globe. Director, Tony Rodwell, claims its export trade is booming of late, with its products installed on fleets as far afield as Singapore (ComfortDelGro) and Hong Kong (KMB). Tony mentioned he was in discussions for possible deals in Japan and Paris. Compak is nearing the release of its newest product, a light weight electric version of its Compak 5 ramp. Its weight has been reduced in response to the introduction of Euro6. Unlike the compressed air powered models often employed in these applications, Tony claimed the electric versions have the advantage of avoiding moisture build up and the associated problems caused by this. It is the in-service performance of its products that helps keep the company at the forefront of the industry, according to Tony. Looking to break even further into the PSV lift segment is Dhollandia. The company’s lifts are widely fitted by Van Hool and a number of other European vehicle manufacturers. Its newest product is the DH-CH.100, a heavy duty cassette lift to help wheelchair users board and disembark midibus and coach size vehicles. The whole range can carry weights of 350-450kg and there are different versions designed for mounting in varying positions around the vehicle. Beyond the DH-CH.100, Dhollandia has lifts to suit all bus, coach and CT vehicle applications. Its products have a number of specifications, including automatic kill switches for when it reaches ground level, anti-slip coatings for the platform and automatic bridge plates, as well as all the industry standard features expected on lifts. The company’s passenger vehicle lift specialist, Eddie McIver, said that what makes the company stand out from others on the market is the fact 98% of its products are manufactured in house. This means it is not reliant on outside suppliers, which Eddie claims should give the customer more confidence in using the equipment. Mobility Access produces a range of manual and electronic cassette steps, all of which are assembled in the UK. Its products are suited to all PCV operations, in particular CT and minibus applications. It also provides cantilever steps and various accessories for installing and maintaining the products. The company aims to use quality materials for its equipment, designing them to be as low weight as possible. According to Director, Mark Quest, it strength is the fact it offers a ‘complete service’. Its goal is to not only supply the equipment, but to provide quality service as well. To achieve this, it has a network of accredited service agents. Mark said that to ensure maintenance is kept at a minimum, the company incorporates less moving parts. 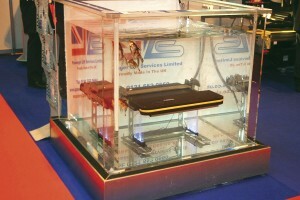 Visitors to Coach & Bus Live earlier this year would have noticed PLS’s Aqua Step submerged in a fish tank. 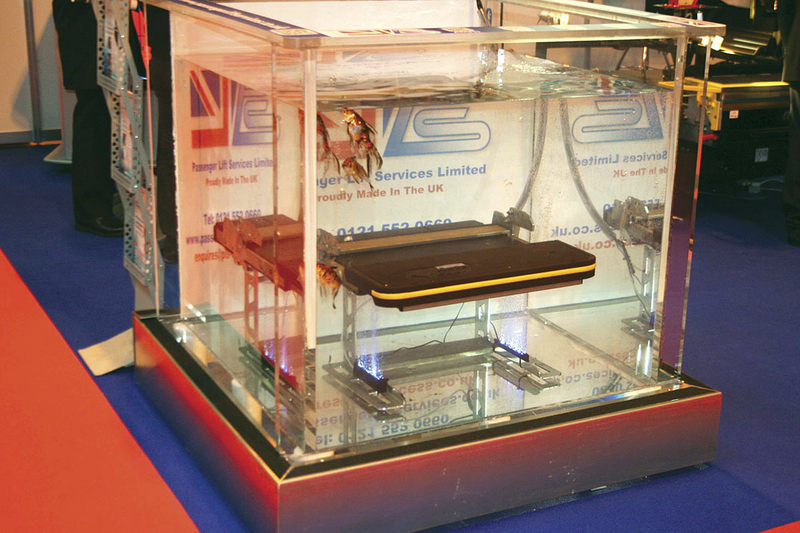 The display was to demonstrate the product’s ability to function even when completely underwater. The automatically operating minibus step extends from beneath a vehicle and features hands free deployment. The telescopic version is 670mm wide and 300mm deep, whilst the parallel model is 1,000mm wide and 270mm deep. The exhibition proved to be quite a busy one for the company, as it also launched its Access Lite underfloor cassette lift at the show. According to the company, the new design delivers a 50kg weight reduction when compared to similar competitors’ lifts. Automotive rivets have replaced bolts so that a double benefit is provided in terms of ‘vibration-proofing’, as well as achieving a 15% reduction in build time. For extra durability, it also benefits from a new triple coating paint coverage method. Also manufacturing in the UK is Portaramp. Building ramps for various applications, one of its most well known products in the bus and coach industry is the Easyramp, specially designed for welfare minibuses, PTS vehicles, ambulances and for loading applications. It has been designed to have a simple, single handed operation for deployment and stowage of the ramp. Manufactured from a lightweight aluminium panel with a honeycomb structure, it incorporates a slip resistant surface, 50mm side rails for added safety and a quality paint finish. Available in standard lengths of between 2,000mm to 3,000mm, it can alternatively be designed and manufactured for bespoke solutions for a wide range of applications. Quick release attachment options are available for it. The lifts make it so much easier. More safe too.